I want to use the FatFS library in my project. I installed it, by adding it to the lib_deps in the configuration file. It installed successfully (afaik). Why doesn’t it find the header file? It is referenced from my projects header file (main.h). And the file certainly is in the <PIO-project-root>/.piolibdeps/FatFs_ID1805/src/ folder. I tried changing lib_ldf_mode to all possible values - still doesn’t help. What should I try next? One workaround to make LDF see the missing header file is adding the path manually via build flags. Then it found the file, but still didn’t compile. Then the IntelliSense issue was resolved, but I still couldn’t build the project successfully. QUESTION 2: Since the beginning I had the include_dir = inc option added to my configuration file. Shouldn’t this take care of IntelliSense paths also? Why do I have to add this manually? Any idea how should I approach this problem? 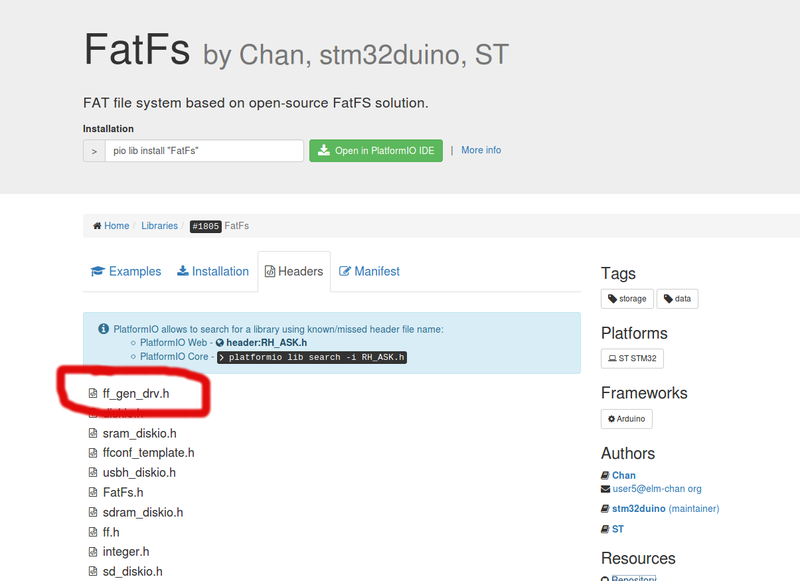 In the repository I don’t see the ff_gen_drv.h and its included file include the relevant header file stdint.h for uint8_t. integer.h imports a bunch / delcares a bunch of Windows-style integer types. A #include <stdint.h> at the start of gg_gen_drv.h should fix that. For the other issue: I experienced this myself sometimes but never bothered to know why. Now that we have a concrete case I’d also like to know why it does not auto-include (-I) the src folder. And adding #include <stdint.h> indeed does solve the problem. I don’t see an end to this >.< Since I mentioned several problem, should I open some issues here in PIO Community or maybe Git hub? Where exactly? You read my sentence wrong / I didn’t write it carefully enough: I meant I did that these files and its children include stdint.h, I did indeed see ff_gen_drv.h file. The file should be included by #include <cmsis.h> (should go down the rabbit hole to core_cm4.h, so try this maybe. I’ll investigate the library later, but if it’s a library issue and it doesn’t compile on pretty much all platforms, a issue in the library’s github should be filed. /home/jure/.platformio/packages/framework-stm32cube/f7/Drivers/CMSIS/Include/core_cm7.h:1834:37: error: unknown type name 'IRQn_Type'; did you mean 'ITM_Type'? After you check it, please let me know if I should fill the git issue or link yours if you will do it - if that is fine with you? Thanks alot for helping out! Did you get anywhere ? My first attempt with platformio and I have installed the Blinky library to project .piolibdeps and #inlcude <Blink.h> doesn’t work. I tried rebuilding the intellisense stuff. Frustrating. LDF doesnt see header in installed library? Seems spot on. But OK, I shall create a new topic later.